The history professor who directs UNC’s humanities program was honored Friday with the GAA’s Faculty Service Award. The GAA Board of Directors presented the award to Lloyd Kramer, faculty director of Carolina Public Humanities. The award, established in 1990, honors faculty members who have performed outstanding service for the University or the association. The Tennessee native earned his doctorate at Cornell University and joined the history faculty at UNC in 1986 after teaching at Stanford and Northwestern universities. In addition to teaching, advising and mentoring thousands of undergraduates and graduate students, Kramer has held three major administrative positions at UNC: chair of the history department for nine years, acting director of the Institute for the Arts and Humanities and, since 2014, faculty director of the humanities program. 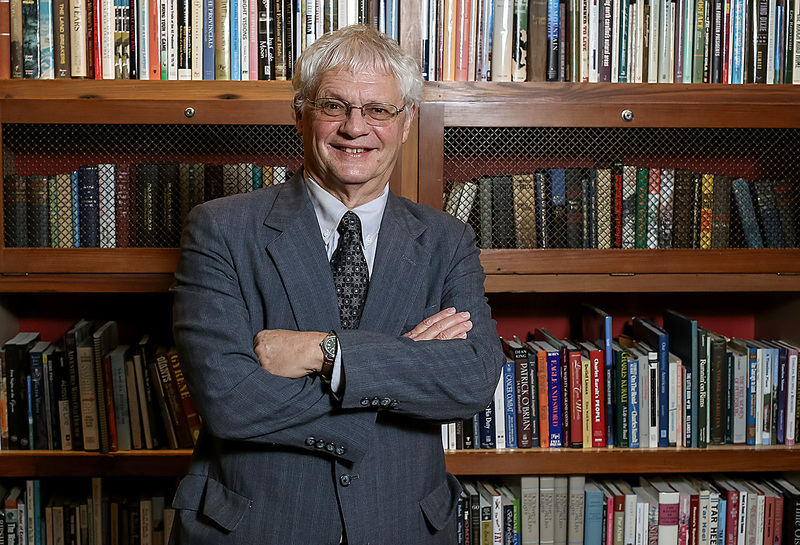 In 2014, Kramer became director of what was then called UNC’s Program in the Humanities and Human Values. He worked with his colleagues to change the name to Carolina Public Humanities and to extend the reach of the humanities in schools and communities across the state. He expanded a series of on-campus lectures and seminars by organizing more community discussions — led by faculty speakers at bookstores, community colleges, and the public library — that made room for people to air opposing views on value-laden topics. He also helped to expand Carolina K-12, which provides workshops for public school teachers throughout North Carolina and encourages new approaches to teaching history, politics, culture, literature, and music. Kramer, whose research focuses on modern European history with an emphasis on 19th century France, has held UNC’s Dean E. Smith Distinguished Term Professorship and received the William F. Little Distinguished Service Award from the College of Arts and Sciences, as well as two prestigious teaching awards, the Johnston Teaching Award for Distinguished Undergraduate Teaching and the Outstanding Undergraduate Teaching Award. He also has led or served on many campus boards and committees. For the GAA, Kramer has spoken at admitted-students receptions, served as an enrichment lecturer on GAA tours and moderated the “Consider This” forum, as well as serving a year as faculty representative on the Board of Directors. Read a complete list of past Faculty Service Award recipients. James H. “Jim” Johnson Jr.